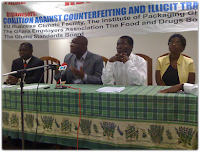 Mr. Kofi Essuman, President of Ghana's Institute of Packaging, on Friday called on the government to review or update existing laws on counterfeiting and piracy or enact new ones to curb the menace at a workshop in Accra. “Employment has shrunk from 250,000 in 1985 to below 40,000 today largely due to faking and counterfeiting of African textile manufacturers' designs and trademarks,” he added. This blog is full of these types of stats and calls for action and most of them propose stricter laws and better enforcement, as this article reports too. What caught Afro Leo's eye is the focus on education and defeating the "menace" using the consumer. "Earlier, over 30 students from some Senior High Schools were given awards for participating in the 2009 National Anti-Counterfeit Campaign Competition. Master Nathan Andre Melcom, a student from Tema Senior High School and Master Isaac Koney of Presbyterian Senior High School emerged winners in the Essay and Art Competitions respectively. They each took home a certificate, cash voucher of GH¢150 and a plaque for their school. Miss Emelia Dede Quist from Ebenezer Senior High and Cobbiah Jepheta from GHANATA were second in the essay and art competitions respectively and had a certificate, a cash voucher of GH¢100 and a plaque each for their schools. The third position went to Abigail Adu Pokuwaa and Hamid Nortey who each collected a certificate, a cash voucher of GH¢50 and a plaque for their schools. " Source : Modern Ghana article here and Ghana blog here.